"He is open and honest and steered us in the right direction… we have been extremely happy with our decision. I would call on Wayne again and also refer him to others." Full-time Realtor in Estes Park since 1979.
a veteran professional, a full-time Realtor since 1979 and co-owner of Coldwell Banker Estes Village Properties, Ltd. which he establish in 1984 with his business partner. He provides the expertise and services to ensure your real estate goals are met efficiently, accurately and professionally. Wayne grew up in the Texas Panhandle with Hereford being his hometown and graduated from Texas Tech in Lubbock with a BBA. His first career, for 23 years, was in sales and management for an irrigation equipment company working with farmers in Texas, Kansas, Nebraska and Colorado before moving to Estes Park in 1979. 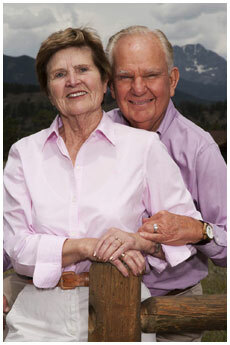 He married Pat in 1952, has four daughters, 13 grand children and nine great grandchildren. As an elected member the Town Board of Trustees from 2000 to 2008, Wayne served as Chair of the Public Safety and the Public Works committees during his term-limited tenure. 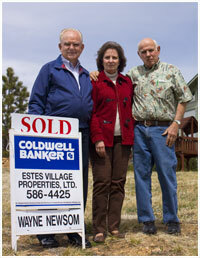 Wayne was a member of the Estes Park Urban Renewal Authority In the last years of the 25 year program. He was Chair in 2010, the final year. Since 2000, in an appointed position, he serves on the Estes Valley Board of Adjustment. Being a long time professional in the real estate business he is a good fit for this respected position. 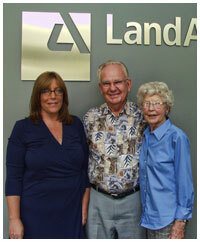 Wayne with clients at another successful closing! Wayne is the professional who knows the Estes Valley area and likes to share his knowledge with those who come his way. He can answer your questions about the community, weather, week-end activities, neighborhoods and the real estate market. He will help you determine your specific needs and work with you to find a property that fits your specifications within your price range. Wayne directs you to a mortgage loan consultant, inspector, appraiser and a title company. He celebrates with you when the transaction closes. as a professional Realtor, Wayne will help you determine a reasonable asking price in today’s market and develop an individual marketing plan. He knows what is important regarding advertising; how to maximize your property’s exterior and interior appeal and will keep you informed as to showings. Wayne will guide you through the process of documents, offers, inspections, negotiations and will celebrate with you when the transaction closes. Pat is Wayne's wife and assistant. Truly a winning combination in the Estes Park Real Estate market!